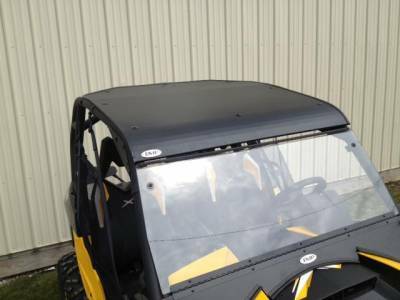 2014-16 Can-Am Commander and 2014-2016 Maverick One Piece Aluminum Top with LED Dome light Fits: 2014-16 Commander and 2014-16 Maverick ONLY NOTE: 2010-2013 models would use #12125, same design, just different mount locations. One piece construction- fabricated from nearly 1/8" thick 5052 Aircraft Grade Aluminum Battery operated LED dome light and aluminum housing. Adds only 1/8" to the height of your Can-Am Maverick or Commander. Powder coated with a mini-texture black for superior protection. Attaches with rubber coated straps to protect your cage. Laser cut and CNC formed to ensure a perfect fit. Ships UPS or FED EX ground to your door. Made in Cleveland, Ohio.